Battery Isolators, Automatic Charging Relays (also called ACRs , combiners, or voltage sensitive relays) are all intended to keep a load (or loads) from discharging the reserve battery system. The reserve battery system is used for vital loads like engine starting, navigation or communications. Battery Isolators and ACRs are intended to distribute current from a charging source to all batteries, but leave the batteries isolated during discharge conditions so they are only impacted by their own loads. Battery Isolators are made with two or more silicon diodes that act like check valves. The diodes will pass current from the charging source to the batteries, but will not pass current backward from one battery to the other or back to the charging source. Nature extracts a price for this by causing a voltage drop of about 0.7 Volts across the diodes. If you have a regulated charging source that senses its own output, the voltage at the battery will be lower than at the charger or regulator and, if not compensated for, will lead to inadequate charging. ACRs or Automatic Charging Relays are automatic switches that close when the voltage on one of the batteries rises to a level (normally 13.2V to 13.7V) indicating the battery is connected to a charge source and is partially or fully charged. The switch then closes and shares the charging current with the other battery until the voltage drops to some lower level (normally 12.4 to 13.1 depending on model) and the switch opens. This prevents discharging both batteries when there is not enough current to charge both batteries. With the ACR or an isolator, the batteries are effectively connected together during charging and disconnected during discharge. The isolator is the simpler of the two approaches, when used with remote sensing chargers and regulators, but without remote sensing the isolator gives poor performance. The ACR simplifies the system design because chargers and regulators that work with a single battery bank will still work with a multiple battery bank. 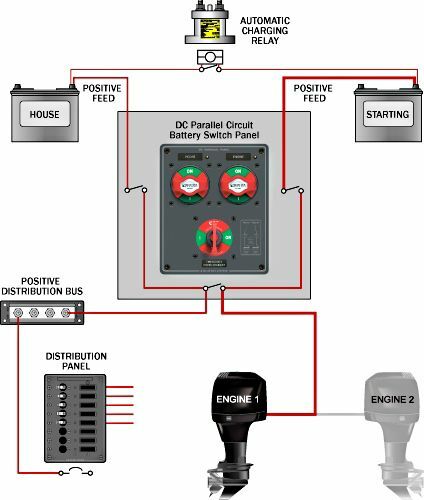 Outboard motors and inverter / chargers have a single line that provides charge current, but can also absorb starting current or inverter current. They can't be connected through an isolator because the isolator will not permit the backward flow of energy when the source becomes an intended load. There is an issue with multi-stage chargers which cut back to a lower charging voltage for “float“. If the charger is supplying one lightly loaded battery directly and supplying a second battery through an ACR, and the second battery is the one that gets loaded, the system may not respond. The voltage of the first battery can be too low to trigger the ACR during the float stage while the loaded battery is being discharged. Because the ACR does not close, the multi-stage charger cannot see that the second battery needs charging current. This is usually resolved by connecting the multi-stage charger to the battery that has a load connected instead of connecting to the unloaded bank. Many multi-stage chargers also come with multiple outputs and the second output can be helpful in this situation and avoid loss of charge during the float stage. ACRs and Battery Isolators are a valuable addition to a battery management system and simplify charging multiple battery banks while protecting the reserve battery system. Below is a diagram of an ACR used in a two battery system.